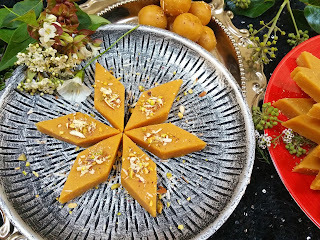 Besan Chekki / Besan Burfi ! The simplest way out. Vijayadashami known as Dasata, Dusshera or Dussehra is a major Hindu festival celebrated at the end of Navratri every year. Vijayadashami is observed for different reasons and celebrated differently in various parts of India. In the eastern and north eastern of India , Vijayadashami marks the end if Durga puja, remembering Maa Duga's victory over the Buffalo demon to help restore Dharma. In the northern,southern and western states, the festival is synonymously called Dussehra (also spelled Dasara, Dashahara). In these regions, it marks the end of "Ram Leela" and remembers God Rama's victory over the demon Ravana, or alternatively it marks a reverence for one of the aspects of goddess Devi such as Durga or Saraswati. 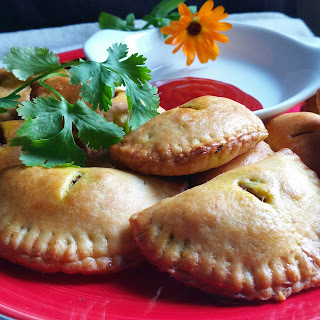 Not knowing the significance of it, My childhood passed away thinking Dussehra (for that matter any festival) is meant for enjoying goodies and gorging on to Besan chekki :p .
Mushroom Empanadas Recipe is the flour pastry filled with delicious and spicy mushrooms. These empanadas are either deep fried or baked; baked ones are a healthier version, which I have made here. You can make these empanadas for this forthcoming festive season and entertain your guests. 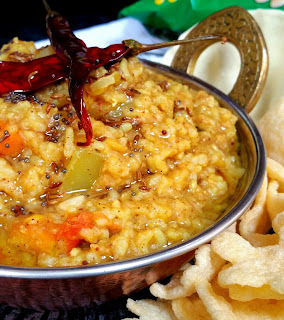 Sambhar Rice , A comforting meal ! Combine simple ingredients into one pot for a complete meal that doesn't require extra work. These quick and easy one pot recipes are simple enough for any meal of the day might be brunch/lunch or dinner as well for the busy weekdays, lazy weekends and also special enough for guests. Sambhar rice is a comforting soul food thatis rich in nutrients containing lots of vegetables and lentils, making it a perfect meal for any time of the day. Sambhar rice, comparatively is lighter and simpler than Bisibele bath and has intense flavors of Freshly ground masala paste that makes it stand out and no wonder, it is enjoyed by majority of the crowd.